"The everything marinade to add a LITTLE SPICE to YOUR LIFE"
Originating from a tiny kitchen on a hill top in St-Ann's Jamaica, this family jerk recipe has been passed down over generations only to be fortunate enough to end up in your kitchen. Jerk is like a great BBQ sauce. Every one has a secret recipe but only few can truly master the art of making an authentic sauce. Laine's marinades has been passed down from generations, originally being made in 1908. The secret to the success and taste of this particular marinade is that the recipe has not changed or been modified since that time. The family has held on to the recipe all these years sharing the end product with family, friends and neighbours for over a century without making any amendments to the recipe. In 2015 we decided to share the amazing taste of Laine's Marinades with the world. Laine's Marinades are available currently in Ontario and Quebec and quickly expanding across Canada. Our Marinades are being used in many local restaurants as the main ingredient on many of their featured dishes. All marinades are vegan, made from scratch and contain no preservatives. We use authentic, dried as well as fresh herbs, spices and ingredients in our marinades. Our marinades can be used on anything...seafood, poultry, meats, in sauces, soups, vegetables...it truly is "an everything marinade!" A melange of hot Jamaican herbs and spices. **NEW PRODUCT **Laine's Original Hot & Spicy Jerk "OIL"
An explosion of garlic, honey, home made bbq & original jerk herbs & spices excellent for the BBQ lover in you. Great to marinate or brush anything you want to BBQ! Our marinades, oils and treats are made with authentic & natural products and do not contain any preservatives or added sweeteners. Available in 125ml & 250ml portions. Also available by the gallon/bulk quantities. Available in 125ml & 250ml reusable mason jars. Marinate the shrimp overnight, skewer, then grill or skewer and brush with marinade while grilling. Split lobster tail and place on baking tray or on grill. Brush with marinade. 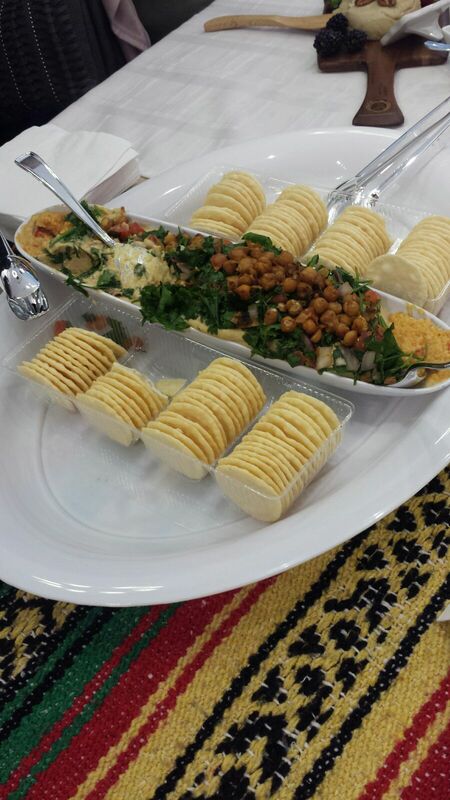 Laine's Marinades can prepare and ship custom baskets for any occasion. Marinade shrimp with jerk marinade, leave in fridge for 24 hours. Remove from fridge and sauté in a non-stick or stainless steel pan. Take home are ready made Cookies in a Jar. Make our great recipes at home. Vegan Jamaican Rum Cake "Black Cake"
A Vegan twist on this signature Jamaican Holiday Treat! Heat stainless steel pan. Pan fry salmon, brown on both sides. Base salmon with your choice of Laine's marinade and finish cooking the salmon in the oven at 350 degrees. 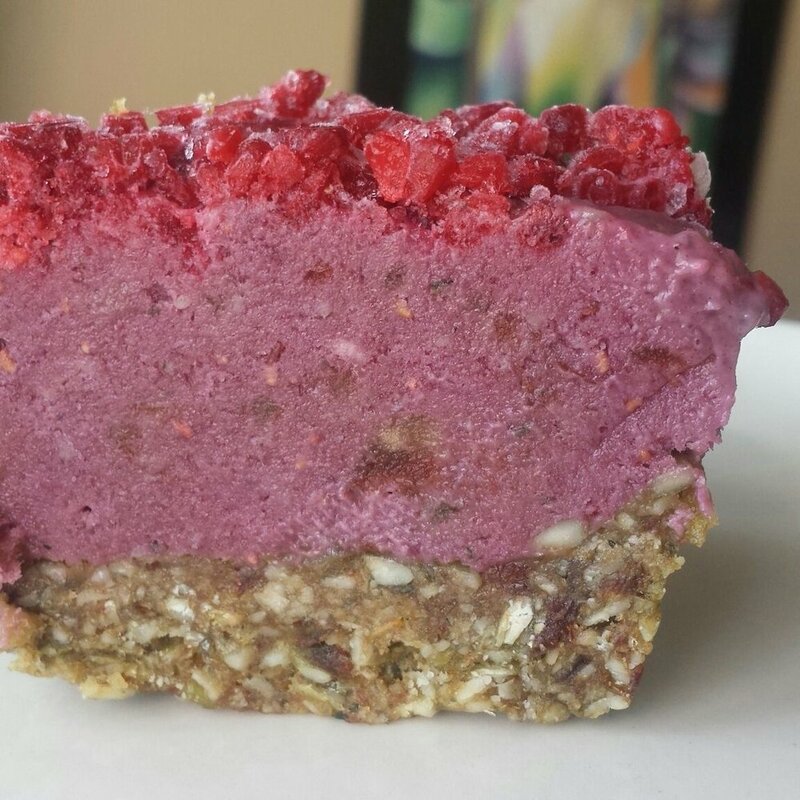 This is our raw frozen raspberry bliss cheese cake!! Marinade salmon steak for 2 to 24 hours depending on the time that you have. Prepare salmon on the grill or in the oven on a cedar plank with sliced lemon on top. Great recipe for leftover rice. stir fry rice, vegetables of choice, eggs, soy sauce and add Laine's marinades to taste. Continue to stir fry until rice is coated. Marinade ribs for 24 hours with Laine's Honey Garlic BBQ Jerk marinade. Pre-cook ribs in oven @ 350 degrees for 1 hour. Move ribs on to grill and continuously base with Laine's Honey Garlic BBQ Jerk marinade. Please contact us for delivery, bulk purchase or for any questions or concerns that you may have. We look forward to hearing from you. Thank you for contacting Laine's Marinades. We are committed to responding to your e-mail within 24 hours. 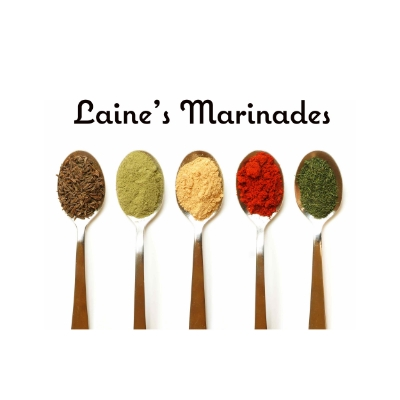 Laine's Marinades can be purchased in a variety of ways. We want our marinades in your home! DELIVERY: Delivery available within the GTA for purchases of 4 bottles or more. Pick up can be arranged for purchases of 4 bottles or less. Contact us via our online form to make arrangements. LOCAL MARKETS, POP UPS & EXPOS: We're on tour! We are dedicated to participate in and support as many local markets & expos as possible. We invite you to come out, visit and purchase our products as well as the other interesting products at these events. UPCOMING 2018 Events, Markets & Pop Ups "We will be there!"